While several companies offer mail-in services to allow you to assist your clients convert their collection, nothing could be easier or more profitable than having a low-cost machine in-house to do this process for your customers. Instead of packing shipping containers, you can easily load a machine that automatically gives you the same results, completes the job days faster, and let’s you keep the service fees. At over $1.00/CD savings over the mail-in services, it won’t take long to reap the benefits of purchasing Encode Center Pro. Along with providing high-end customer results, Encode Center Pro is a substantial profit center. 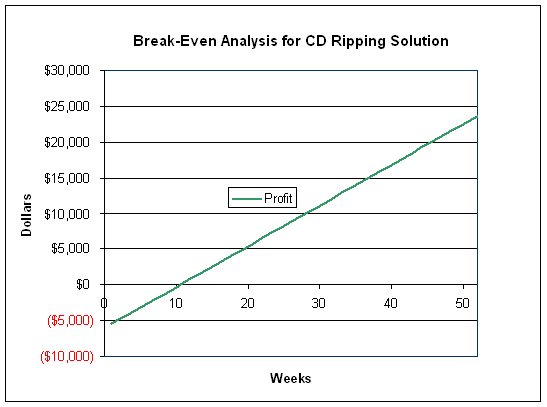 For example, given a modest cd processing quantity of 300 CDs per week, the break-even point of the Encode Center Pro purchase is only about 8 weeks. That's running at only a fraction (less than 30%) of full capacity. At capacity, the break-even would be as little as 1 month. Get Digital Data’s Encode Center Pro software can be a key element in your value offering for your clients. Using Encode Center Pro, and the robotic changer of your choice, you can easily transfer your clients CD collection to any media server device. Encode Center Pro consists of Get Digital’s Encode Center and AudioGroomer by Ripfactory. Encode Center enables all the CD ripping and automated DVD burning functions and AudioGroomer gives you the ability to easily view and edit the collection as well as format the results for any specific media center. Purchase an Encode Center Pro HW bundle, or if you already own one of the supported CD changers, you can just purchase Encode Center Pro. Encode Center Pro will create the MP3, WAV, or FLAC library that can be transferred to the media server of your choice.